On this date in 1582, Philippe Strozzi, the Florentine-born commander of a French naval expedition against the Spanish was summarily executed as a pirate. The Strozzi were long one of Florence’s wealthy and powerful families, as evidenced by, say, the Strozzi Palace, or the Strozzi coat of arms on Michelangelo’s Doni Tondo. That made the Strozzi sometime-allies, sometime-rivals* of Florence’s more famous powerbrokers, the Medici. It is in both capacities that we meet Philippe (English Wikipedia entry | Italian | French). To cut a centuries-long story short, the Strozzi had basically come out on the wrong side of the power struggle in the 16th century. Your basic tangled geopolitical-genealogical web. Bottom line, Piero’s son Philippe was born in Florence but grew up Gallic, and fought in the French army all over the continent from the time he was a teenager. When France got involved in the War of Portuguese Succession, they put this warlike fellow aboard a boat and sent him to dispute Spanish King Philip II‘s attempt to claim the Portuguese throne and unify the Iberian peninsula. Strozzi’s armada got its clock cleaned at the naval Battle of Ponta Delgada near the Azores, with devastating loss of life. 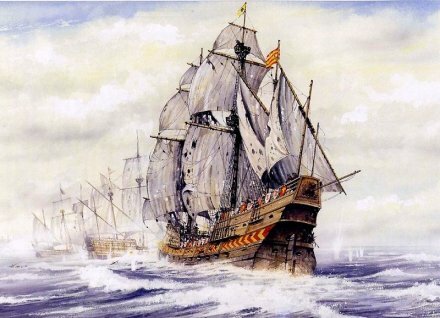 The Spanish galleon San Mateo, which did yeoman service at this battle. Since Spain and France were putatively at peace, Spain treated its captives not as prisoners of war but as pirates, and proceeded to execute several hundred in Vila Franca do Campo. Strozzi didn’t even get that much ceremony, however; the day after the battle, he was mortally stabbed, then tossed into the waves. * The Strozzi-Medici conflict frames the action in the play Lorenzaccio, in which the titular Brutus-like character mulls assassinating the Medici dictator in order to restore the Republic, only to find no such restoration in the offing once he actually does the deed; the father and grandfather of our day’s protagonists are both principal characters. ** That didn’t work. Strozzi was trounced at the Battle of Marciano, which signaled the permanent demise of the ancient city-state‘s independence. Antonio’s statement seems in keeping with military and naval practices of the day even among Moslems pirates in North Africa who often kept alive prisoners they hoped to ransom. Such was the case of Miguel Cervantes de Saavedra (El Manco de Lepanto) who was captured off Algiers and later ransomed later to write the epic novel Don Quijote. However it was not always the case. Piracy in peacetime as it is now was an international crime punishable by death all of course depending on the person’s social/political status. Common sailor pirates received on the spot drum head trials as it happened in 1596 when Sir Francis Drake attempted to capture a gold laden galleon in San Juan harbor Puerto Rico only to be repelled by the Spanish who captured a sizable number of English sailors and beheaded them on the spot even before the sight of English ships lying off the harbor. I would like to point out that there is no evidence that Strozzi was executed. There was a big execution, that’s is exact according to the accounts, in which more than three hundred french prisoners were killed for the reasons you correctly explained. About 80 were beheaded (the knights), the rest (seamen, soldiers, etc, with no high social condition) were hanged by the yards of the ships at harbour of Vila Franca. But in regard Strozzi it seems that he was seriously wounded during the battle and died soon after, perhaps even before the battle was finished. It matches with the fact that he was aboard the “Saint Jean Baptiste”, the flag ship of the French fleet, that was engaged in the main fight of the battle, against the “San Mateo”. The “Saint Jean Baptiste” received during the battle a constant supply of men to replace those who died or were wounded in the attemps of boarding to the “San Mateo”. The total account of men involved in these unsuccesful attemps reached about seven hundred, and those who died about the half of them, being the rest the main group of those who became prisoners. To the Spanish commander it would have been very attractive to have Strozzi prisoner with the rest of his men and to use him in the ceremony of the trial and later in the execution. And there was no reason, in this sense, to kill Strozzi and throw him overboard, except if that happened during the busy moment of the battle, a circumstance in which it was the custom in naval battles during centuries to put away any dead body for practical reasons, whether yours or enemies. Unfortunately, the fact is that there is not so much information about this battle, a very important battle, as of any others of the age. A respectful and friendly salute to you and your readers, sir.